Throughout the year, I’ll occasionally focus on a single winemaker and it only makes sense to feature promising winemakers few people have yet to meet. 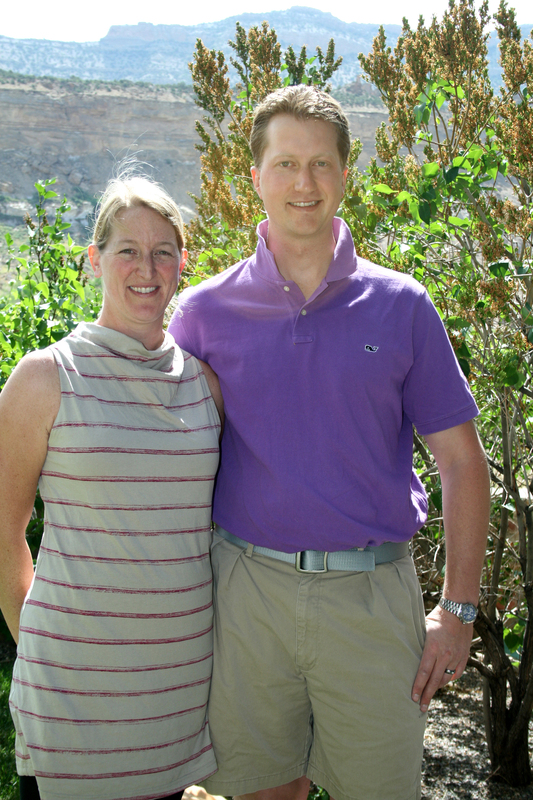 This week I visited Jay and Jennifer Christianson of Canyon Wind Cellars in Palisade. PALISADE, Colo. – On a warm late-spring morning, surrounded by acres of emerald-green vines, Jay and Jennifer Christianson, owners of Canyon Wind Cellars, looked around and saw the future around them. Jennifer and Jay Christianson of Canyon Wind Cellars in Palisade, Colo.
Perhaps that should read “new” owners, since the current generation of Christiansons two years ago assumed day-to-day operation of the winery started by Jay’s father, Norm Christianson, in 1996. The changes initiated by Jay and Jennifer are subtle but reflective of lessons well-learned during semi-regular wine-tasting trips to California and other wine regions. Jay is typical of many second-generation winemakers who grew up in the winemaking business, learning at his father’s side about the finer points of wine. He received his initial taste of the labor side of the business working his first harvest at the age of 9. Jennifer’s wine education, however, has been on the fast-track since the two were married in 2009. The two met in Vail, where Jay was balancing jobs as a youth ski coach and as the Front Range marketer/salesman for Canyon Wind and Jennifer was the fundraiser and development director for local and U.S. team skiers. He asked her to pet-sit his two dogs while he made one of his road trips to Denver and it wasn’t long before that temporary job turned into a long-term relationship. “I thought (ski team fund-raising) was pretty much the coolest job until I got into winemaking,” Jennifer said. Jay, 30, and Jennifer, 36, are among the first of Colorado’s nex-Gen era of winemakers, along with Julie Balistreri of Balestreri Vineyards in Denver who also continues the winemaking tradition of her father and grandfather. Being that bridge between generations requires not only continuing the tradition and reputation honed by the winery founders but also reaching out to the savvy younger crowd of wine lovers whose preferred wine-list reading runs to blogs, Twitter, Facebook and other social media. What isn’t lost on the two young Christiansons is that the best way to sell wine is to make good wine. With Jay’s knowledge of the retail side gained from years marketing and selling Colorado wine before Colorado wine became popular (“You learn to have a pretty thick skin,” he said of those days) and Jennifer’s MBA background in human resources and her well-tuned palate, which Jay readily admits is better than his, the two are aiming at an audience looking for something perhaps a bit different than other Colorado wineries. As a winery, Canyon Wind Cellars, which still sees the seasonal guidance of winemaker and winery consultant Robert Pepi, produces 14 wines under three labels: the affordable 4710 brand (named after the vineyard’s elevation); eight varietals under the familiar Canyon Wind label; and the Anemoi line, a name Jennifer found while perusing an assortment of lists and books while accompanying Jay on his frequent four-hour drives to Denver. Anemoi (it’s “ann-eh-moy”) refers both to the Greek wind gods as well as the canyon breeze that cools the vineyard in summer and protects it from frost in winter. Jay’s father Norm called that canyon wind a million-dollar breeze for its unmistakable value in savin countless harvest from early and late frosts. It’s the Anemoi wines, currently two hearty red-blends named Boreas (north wind) and Zephyrus (east wind) and Iapyx (the north-west wind), a late-harvest pinot grigio, that most excite Jay and Jennifer and where they see their future. The two red wines are produced in limited amounts and as such are premium priced ($35 each). The 2009 Boreas ($35) is a true vin de terroir, blending cabernet sauvignon (43 percent), merlot (21 percent), cabernet franc (21) and petite verdot (15) into a dark wine of full fruit flavors, round tannis and a lasting finish. The 2010 Zephyrus ($35) is 50/50 cabernet franc/petite verdot, taking full advantage of two varietals that are doing well in the Grand Valley AVA’s high-desert climate. The Christiansons also hand-number each bottle of Boreas, a time-consuming act thoughtfully done, giving Jay and Jennifer one more connection with an unseen consumer in whose opinion lies the future of their efforts.